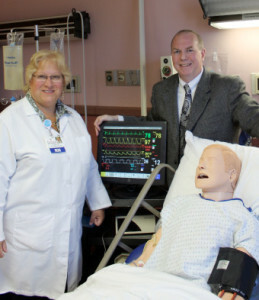 Michele and Joe in sim lab training classroom. When should I start taking ACLS, BLS, and PALS? Usually, the school requires BLS prior to starting the clinical part of your studies. Many schools may offer BLS as part of the curriculum. However, you will need BLS certification when applying for a nursing position for internship or after graduating. The advanced courses, such as ACLS and PALS, look good on your resume but are not usually required to get hired. If looking for entry position into a critical care area, ACLS is usually required. How long are my AHA certification cards valid for? The ACLS, BLS, and PALS certification cards are valid for 24 months. For example, if you take a class in November of 2018, your card will expire on the last day of November in 2020.
order you a new replacement card: ACLS is $17, BLS is $13, PALS is $25. But, for classes that were completed as of September 2017, all cards are now ecards, and are emailed directly to you. You can access your AHA online account anytime, and print or download your ecards. What if I fail the written exam? You can come back and repeat the class on another date, take the entire class again, and take the exam again – for no additional charge. 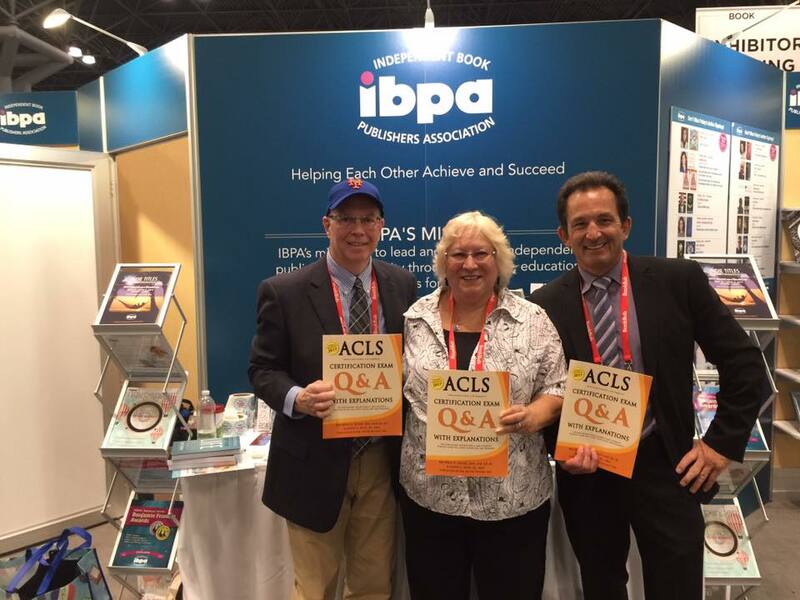 Joe and Michele with their “ACLS Q&A With Explanations” certification exam prep book, on display at the IBPA booth, at the Book Expo at the Javitz Center, in NYC. I haven’t taken an ACLS class in many years – and now my hospital requires it. What should I study before taking your class? For the ACLS class I want you to study ECG/EKG. I want you to get the AHA textbook for ACLS and review it. The AHA provides a great website for students. You can also email or telephone me with any other ACLS and ECG/EKG questions about something you don’t understand. I have been out of nursing for several years, and would like to take your ACLS and BLS class to prepare myself to re-enter the workforce – and I am afraid that these classes will be too difficult for me to pass. Do you have any suggestions? Yes. Get your hands on the ACLS textbook and the ECC guide. Also, I provide plenty of help and guidance well before class, and the day of the class. Also, taking a basic-ECG/EKG-interpretation class helps with understanding and passing the ACLS class. I too would like to become a nursing teacher or continuing education instructor. Any advice? Yes. You should strive to become the expert in your unit/office in your particular subject-area. Learn to teach by teaching the other nurses in your unit/hospital/office. Teaching is just like anything else, you must practice it by doing it. Develop a subject outline and study-guide for the subject that you want to teach. Developing this outline and guide will force you to learn and understand all of the intricacies of your subject. The outline and guide will also impress the other nurses and help with your credibility. There are contact-hour programs offering applications at national and state specific websites such as NYSNA and AACN. There are fees involved. Where do I find the ECC updated guidelines? Simply do a Google search for the 2015 ECC guidelines. New guidelines come out every five years. If you are on my email list, I will email you the updates as they come out. Any medical provider can sign-up for my email list. Do I need to complete BLS before taking ACLS or PALS? AHA does not require one to have BLS certification before taking ACLS or PALS. Usually the hospital or facility where you are working will require BLS as a minimum requirement to keep your job. An EKG class would certainly facilitate success in an ACLS program. Do all physicians need to complete ACLS, BLS, or PALS? Any practitioner participating in moderate sedation is required to be certified in ACLS and BLS. PALS is also required for practitioners dealing with children. Will you come to our office to teach us ACLS, BLS, and PALS? Yes. Call me to discuss dates, times, and prices. See my brochure for additional information.